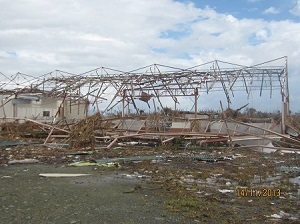 On Thursday November 7, 2013 the whole day had normal weather conditions, although there was an announcement of the coming super typhoon. Towards the afternoon, the weather seemed to be cloudy and dark. The students and employees were told to go home and after Vespers Sr. Julia felt and expressed much fear and anxiety having seen that our site was endangered because we are near the sea. Thus, after a hurried supper and quick packing we called Sr. Ana Maria to have us fetched from the school to go to the hospital. Friday at about 5a.m. we were awakened by the howling wind followed by the torrent rain fall. 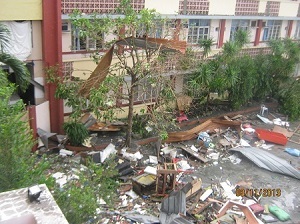 We were unaware of the storm surge that destroyed our buildings in the compound. Saturday communications were cut-off, we had no electricity or water. We were just waiting for the news coming from the outside. 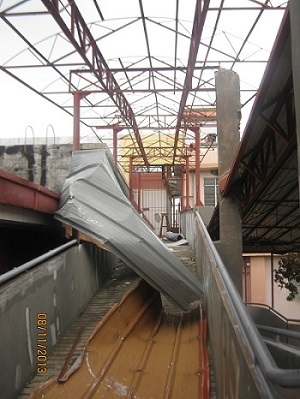 Sunday, November 10th we visited the school to see the damage brought by the typhoon. One could not believe the destruction that we saw in the whole compound: all buildings had the roofs torn off, glass windows smashed, furniture and equipment gone, documents were soaked with water. The gym was partly collapsed and only the kitchen remained. The vehicles were thrown into the lagoon. Our convent was also heavily damaged: partitions of cells fell down, walls and ceilings collapsed. The chapel was muddy and pews and chairs scattered and we could not find the tabernacle. The offices, canteen, gym, convent including personal items were looted by the people looking for the basic necessities. All of us were heartbroken seeing the devastated place. What was once the landmark of Region 8 is now “gone with the wind.” It has lost its beauty and our mission for a good Christian Benedictine education is put to a halt but not lost. But in our hearts there is always hope and trust that God will care for us and is with us.